Tipper hire is an essential part of construction and infrastructure projects in the UK. There are numerous major infrastructure projects happening in the UK right now. All civil engineering and construction projects require the extraction of non hazardous waste from demolished structures, or the removal of excavated muck for recycling or disposal. Contractors are working around the clock to meet the tight schedules of their respective projects. Tipper hire is a key logistical element in the removal of waste off site and the delivery of soil, gravel, and other aggregates on site. Here at ND Brown, we have over 30 years’ experience within the commercial and specialist vehicle hire industry. You can be confident that we have the hire solution to suit the demands of your infrastructure project. Our tipper hire service has supported the construction of buildings, roads, bridges and many more projects above and below ground. Making sure you have the right equipment, personnel and vehicles is essential to successful completion. We have an extensive fleet of tippers available and we are here to supply you with flexible commercial vehicle hire. No project is too small or too large for us. 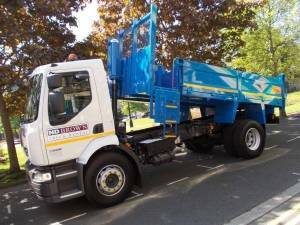 You can be assured of quality, highly maintained tipper trucks, all with safety features and specifications for the smooth running of the project. From small 7.5 tonne tippers for small scale projects with access limitations to specialist cage tippers and massive quadruple axle grab hires. We’ve got everything you need. You will find a complete tipper hire service here at ND Brown. We have depots positioned around the UK so that we can deliver an efficient service to contractors and construction projects within the different regions. To find out more about how we can assist you and to receive a quote, please contact us.